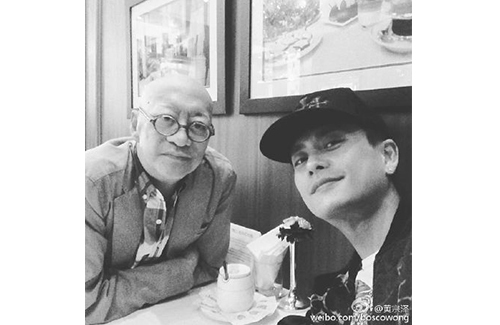 Bosco Wong (黃宗澤) announced on his Weibo today that his father had passed away from lung cancer. His father was 72 years old. Mr. Wong’s death was quite sudden. Although he was diagnosed with lung cancer three years ago, he did recover at one point. However, Mr. Wong suffered a relapse a year ago and was hospitalized in the Union Hospital for a period of time. On Saturday morning, December 12, Mr. Wong was rushed to the Tung Wah Eastern Hospital when he said he wasn’t feeling well. Bosco returned to Hong Kong from Hangzhou the following day to attend the TVB Anniversary Awards, and also visited his hospitalized father. At the award ceremony’s press conference, Bosco received the award for Most Popular TVB Drama Actor in Mainland China, but the K9 Cop <警犬巴打> actor said he wasn’t in the mood to celebrate because of his father’s condition. Sunday, December 13 was also Bosco’s 35th birthday. The actor said his only birthday wish was to see both of his parents healthy. Bosco returned to Hangzhou early Monday morning to shoot the Chinese drama We Are the Best <最好的我們>, but things took another turn when news of his father’s passing struck him on Tuesday. This is so sad… may he rest in peace and Bosco be OK.
Bosco really wanted to be by your side but due to work conflict he cant RIP bosco papa!!!! He will miss u dearly!!! My prayers are with the Wong family. I know that Bosco knew his dad was near the end of his journey here on earth. Still, it is hard to bury your parent/s, especially if you had a close and loving relationship with them. God Speed, Mr. Wong. oh this is so sad. RIP Bosco’s dad. Thinking of u Bosco! May he rest in peace. Bosco must have felt very guilty but it’s not entirely his fault that he doesn’t have much time for his family. Hope Bosco doesn’t blame himself too much. I think something must be lost in translation. How can Bosco accompany his father on his final journey? RIP senior Mr Wong. @isay To accompany one on their last journey is to stay by their side til their last breath. It is a very important cultural thing for sons to do as well as an emotional one where last words are exchanged to patch up any regrets. @elizabeth hi yes i know what the article is trying to say but it just sounds weird to me. Perhaps it should have been translated as “to say his final farewell to his father”. I never knew Bosco was close to his father. Great to know that he was close to his dad. I hope he rests in peace and his father will forever live in his heart. My deepest sympathies to Bosco and his family. @hetieshou He is closer to his mother who raised him up. But he kept contact with his father. Of course I know that but it is great that he also loves and kept in touch with his father. That’s sad not to be able to be with your loved one and see them for one last time. My uncle died from cancer within a few months after being diagnosed with bowel cancer, and I couldn’t get back to see him for the last time due to work commitments. I understand how Bosco feels. But at least they had a pretty good relationship between them, Hope he feels better soon. stop it Bosco with the reasoning !! how dare you say due to work can’t attend dad final moment… i would be on the 1st flight back to be with the family. No wonder Myolie left you, I bet he made so much broken promises to her. Look he can’t even be next to he dad. Well said jjwong! When you are working and you are not in another person’s shoes, many things are a lot easier said than done. @vodka what a cruel comment! If you don’t have anything nice to say, don’t say anything at all. @vodka im sorry but your comment was uncalled for. if Bosco still has any feelings for Myolie, way to rub more salt on the wound. he admitted that he was a terrible person; what more do you want him to do? Go all emo and cutting himself and starve himself to prove to the whole world that he is upset with himself for being a workaholic? My mom is a workaholic also so that she can put food on the table and did not get to see her father one last time during his passing, so i see this as rude and inconsiderate. Maybe you should be excused for your outburst because you might have had too much vodka. Why bring the irrelevant topic of Bosco’s breakup with Myolie into news of his father’s death. Insensitive and in very bad taste. I’m sure if Bosco knew the exact time his father was going to pass on, he would have been there with him. How could he know, he is not God. His dad died knowing that he and Bosco had a loving father-son relationship and Bosco should take comfort in that. So many family members dies fighting with or hating each other. That was not the case with Bosco and his father. How could you say such things is ludicrous. Then again, you just might need to put away the sauce. @abc123a well said my friend, well said. @riceball120 So sorry about the lost of your grandfather. There are times we have to work to put food on the table, when we would rather be with our loved ones. We love them enough to be a workaholic so that our dear ones don’t starve. Maybe Bosco was working so much to make enough money to pay his father’s medical bills and provide the best of care for him including food, personal care, medication etc. It is expensive to live in HK, even for celebrities. Maybe vodka needs to put away the drink and eat more riceballs. He or she would be smarter then. Bosco’s message to his father is really touching! He is a filial son indeed. RIP Mr. Wong.